You don’t need an interior designer on hand to revamp your pad. Trick it out with a few key pieces from these furniture stores. Swakriti has a variety of furniture, from contemporary to classic, and transitional to modern. The store has a wide range of colourful chairs and drawers and a very Ikea feel, which is great for graphic designers and artists trying to create the ideal work station. Located in Howrah, the Bengal Basket Co. is doing some really interesting work in experimenting with cane furniture. They have moved away from traditional cane furniture pieces and are experimenting with design and making nice sleek cane beds, dining sets and chairs and sofas. Prices begin from INR 4,600. Part of an international chain of stores with designers from all over the world, Scarlet Splendour has a branch on Wood Street. You can choose from over sixteen collections, all curated by different designers. Their Scarlet Eclectics collection has some really interesting products, like Dutch armchairs, and Jacobean seats which have a very Gothic vibe. They also have pop art-inspired pieces such sofas which look like red lips and cactus-shaped room accessories. While all the pieces might not be available at the outlet, you can always check out their website, enquire about a certain piece of furniture and have it shipped to the Kolkata outlet. Run by Srivant and Devina More, this store located on 6, Russell Street immediately stands out. The furniture found here is a range of ‘kaleidoscopic mix of eras, cultures and styles’. 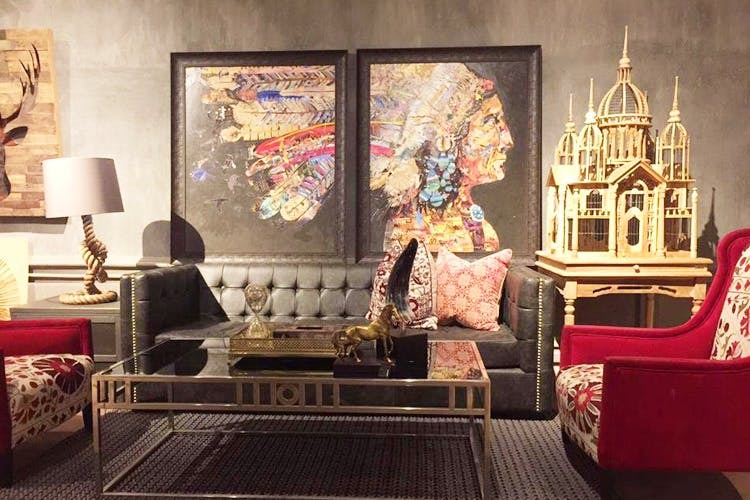 These are personally curated pieces, and Kaji makes it a point to launch a few collections a year to showcase themed furniture and décor at their outlet. The themes are also extremely diverse, starting from Russian-inspired décor and home furnishings, to pirates and cartography. Cane and ethnic furniture lovesr should all head to the Dakshinapan complex in Dhakuria. It is filled with cane furniture shops on all floors. From chairs to swings, to full sofa sets, there is a lot of variety here. These can be found in bulk outside the state emporium stores of Odisha and Tripura. Outside the Rajasthan Emporium, you can find lovely handpainted foldable chairs and ottomans with miniature paintings on them. Things are more affordable here than at other places. This is a tried and tested brand that uses Indian wood like mango, sheesham, acacia and diag wood. Head to their Hindustan Park Road branch which has an individual furniture outlet next to the main store. Futons, beds, side tables, benches, foldable tables, cupboards and shelves – all come with a contemporary+Indian fusion look. Fabindia delivers furniture to your home as well at an additional charge. Near Judges Court Road, there is an entire footpath filled with dealers of old, refurbished antique furniture starting from around INR 2,000. You can get four poster beds with intricately carved woodwork, massive mirrors with wooden frames and old glass lamps. If you’re lucky you might find one of their antique bars which looks like it’s straight out of some 1920s Hollywood film. We love to visit this place to pick up vintage clocks, desks. Furniture from here can add a lot of character to any home. Most of the furniture here is refurbished with recycled teak and mahogany which is a bonus.